Just then the Saha world was transformed into one of purity, with lapis lazuli for soil and adorned with jeweled trees. Its eight roads were bordered with golden cords. In it there were no towns, villages, cities, oceans, rivers, streams, mountains, brooks, forests or thickets. Precious incense was burned and mandarava flowers completely covered the ground. Above it jeweled nets were spread and banners hung with jeweled bells. Only those in the assembly remained, as the gods and humans had been moved to another land. Then all of the Buddhas, each bringing with him one great Bodhisattva as an attendant, reached the Saha World and went to the foot of a jeweled tree. Each jeweled tree was five hundred yojanas in height and adorned with branches, leaves, flowers and fruits. Beneath each jeweled tree was a lion throne five hundred yojanas in height adorned with great jewels. Then each of the Buddhas sat in the lotus posture on his own throne. In this way, by turns, the lands of the three thousand great thousand worlds were filled, and still there was no end to the division bodies of Shakyamuni Buddha from even one direction. Then, Shakyamuni Buddha, wishing to accommodate his division body Buddhas, transformed in each of the eight directions, two hundred myriads of millions of nayutas of lands, purifying them all. They were without hells, hungry ghosts, animals or asuras. The gods and humans were all moved to other lands. The lands he transformed all had lapis lazuli for soil and were adorned with jeweled trees five hundred yojanas tall, decorated with branches, leaves, flowers and fruits. Beneath each tree was a jeweled lion throne, five yojanas tall decorated with various gems. There were no oceans, rivers or streams and no mucilinda or mahamucilinda mountains, no iron ring or great iron ring mountains, and no Mount Sumerus or any other kings of mountains. All became one Buddha land. The jeweled earth was level and flat, covered entirely with gem-studded canopies and hung with banners. Precious incense was burned and heavenly, precious flowers covered the ground. 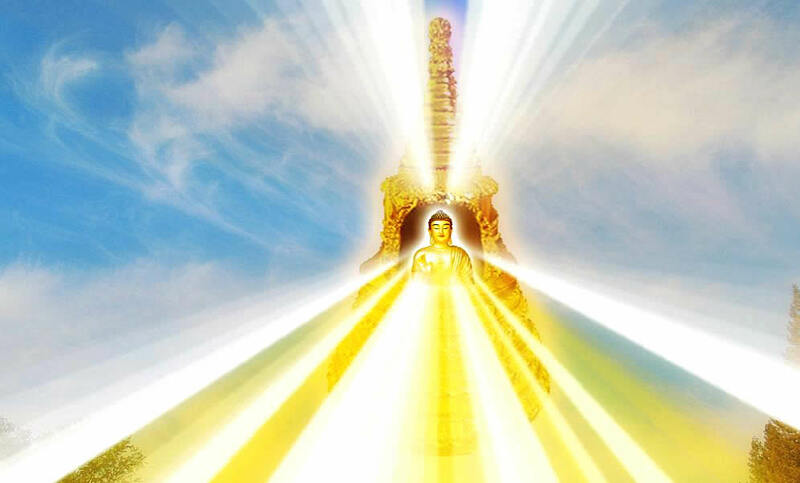 Shakyamuni Buddha, in order that the Buddhas who were coming might have a place to sit, then further transformed in each of the eight directions, two hundred myriads of nayutas of lands, purifying them all. They were without hells, hungry ghosts, animals or asuras. The gods and humans were all moved to other lands. The lands he transformed all had lapis lazuli for soil and were adorned with jeweled trees five hundred yojanas tall, decorated with branches, leaves, flowers, and fruits. Beneath each tree was a jeweled lion throne five yojanas tall decorated with various gems. There were no oceans, rivers, or streams, and no mucilinda or mahamucilinda mountains, no iron ring or great iron ring mountains, and no Mount Sumerus or any other kings of mountains. All became one Buddha land. The jeweled earth was level and flat, covered entirely with gem-studded canopies, and hung with banners. Precious incense was burned and heavenly, precious flowers covered the ground. Then, the division bodies of Shakyamuni Buddha from the eastern direction, Buddhas in number to the grains of sand in a hundred thousand myriads of millions of nayutas of lands, each speaking the Dharma, assembled there. In like manner, in turn, the Buddhas from all the ten directions arrived and assembled there, taking their seats in the eight directions. At that time, each direction was filled with Buddhas, Thus Come Ones, from the four hundred myriads of millions of nayutas of lands in each of the four directions. At that time, all those Buddhas each seated on a lion throne beneath a jeweled tree, sent an attendant to inquire after Shakyamuni Buddha giving them each a sack full of flowers and saying to them, “Good men! Go to Mount Grdhrakuta, to the place of Shakyamuni Buddha and ask, in our name, ‘Are you free from illness and distress? Are you strong and at ease? Are the hosts of Bodhisattvas and Hearers at peace?’ Then scatter these precious flowers before the Buddha as an offering, saying, ‘The Buddha so-and-so wishes that the jeweled Stupa be opened.’” All the Buddhas sent attendants in this manner. Then, Shakyamuni Buddha seeing that the division body Buddhas had all assembled there, each seated on a lion throne, and hearing that all the Buddhas together wished that the jeweled Stupa be opened, immediately arose from his seat into empty space. All those in the four assemblies rose, placed their palms together, and single-mindedly beheld the Buddha. 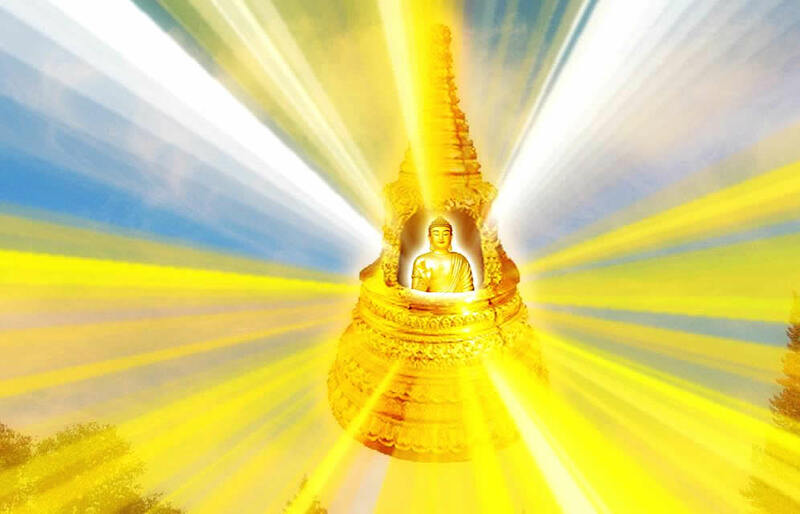 Then, Shakyamuni Buddha, using his right forefinger, opened the door of the Stupa of seven jewels, which made a great sound like that of a bolt being removed from a large city gate. 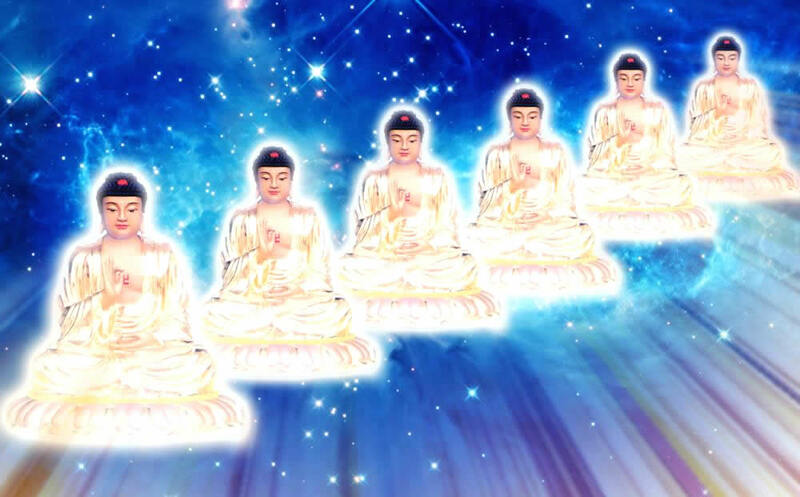 The four assemblies, upon seeing a Buddha who had crossed over into extinction limitless thousands of myriads of millions of eons ago, speak in this way, praised it as something unprecedented, they scattered heaps of precious heavenly flowers upon the Buddha Many Jewels and Shakyamuni Buddha. 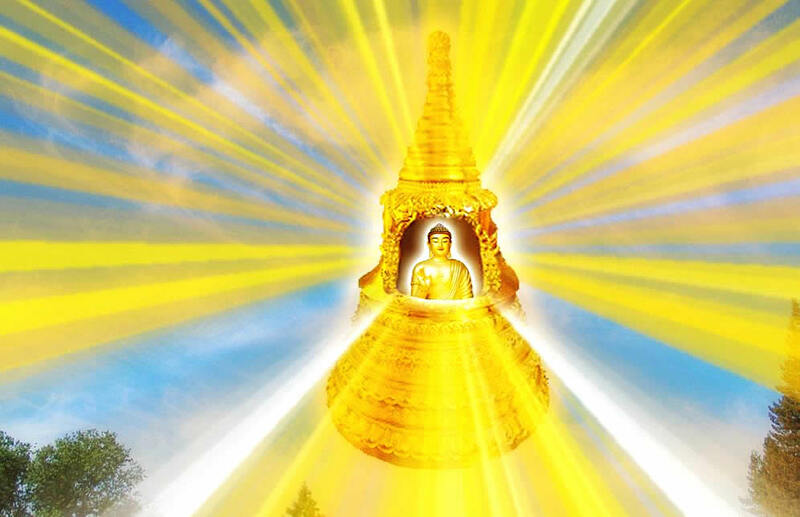 The Buddha Many Jewels, in the jeweled Stupa, offered half of his seat to Shakyamuni Buddha, saying, “Shakyamuni Buddha, would you take this seat?” Shakyamuni Buddha then entered the Stupa and sat down in full lotus on half of that seat. Shakyamuni Buddha then used his spiritual powers and took the entire assembly up into empty space. Has come here for the Dharma. For the sake of the Dharma? Because it is difficult to encounter. Thus Come One Many Jewels. To cause the Dharma long to abide. The Dharma is caused long to abide. Read, speak and recite this Sutra? Will know of this resolution. To me and Many Jewels. For the sake of this Sutra. It would not be thought difficult. That also would not be difficult. That, too, would not be difficult. It would not be difficult. He then upholds the Buddha’s body. Now, in the presence of the Buddhas should make a vow. Dwelling in the pure, good stage. For all gods and humans in the world. Of all the gods and humans.